Farming Simulator 19‘s tagline is “Farm Like Never Before”. The agricultural simulation game from GIANTS Software boasts many new features and upgrades from its predecessor(s) in nearly all areas of the game: visual, gameplay, multiplayer, and overall immersion. So, do those changes all come together into a cohesive package? And is it truly “like never before”? I must admit that in the midst of all the announcements about new features for the game I was slightly concerned that GIANTS had bitten off more than it could chew with its ambitions for Farming Simulator 19, even with the recent expansion of its offices and team. An overhaul of the game’s graphics engine, the addition of new crops and management systems, horses, a dog, a revamped mission system, new ways to “build your own farm”, and revolutionized multiplayer were all promised by GIANTS as upgrades to the existing systems in the game – but could they pull it all off? In a word, yes. While some minor bugs and issues do hold the game back slightly, in my opinion the suite of improvements serve to make this Farming Simulator game a cut above the rest in the series. Just how does it do that, you might ask? The answers lie below. 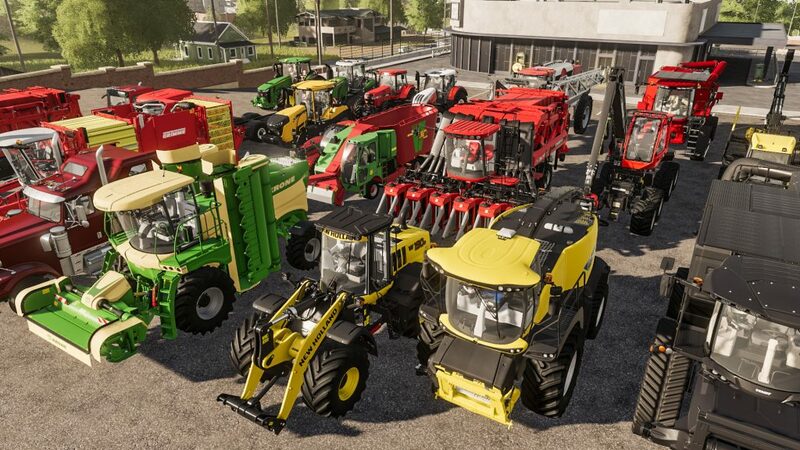 In terms of the sheer number of vehicles and tools in its garage of equipment, Farming Simulator 19 surpasses any of its predecessors, boasting more than 300 vehicles and machines from over 100 brands. Each of these is faithfully reproduced and true to its real-life counterpart, lending substantial realism to the game. As if this isn’t enough, GIANTS has confirmed that mods will be present on all platforms, with GIANTS themselves indicating that they will be providing a map (Estancia Lapacho from Farming Simulator 17‘s Platinum Edition DLC) and the “Big Bud” tractors (from 17‘s Big Bud DLC) as mods at launch. The biggest news in this department is, of course, the securing of John Deere as a licensed brand in Farming Simulator 19. 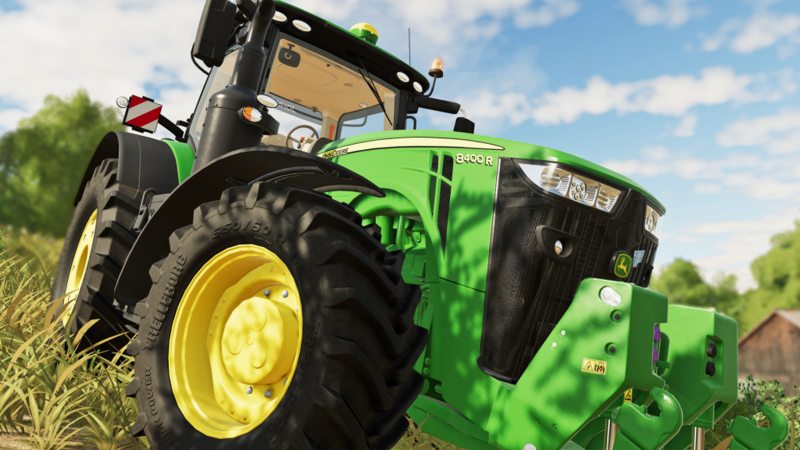 Players have longed for the iconic green and yellow machinery from the world’ largest manufacturer of agricultural equipment to be available in the base version of GIANTS’ game for many years, and that day has finally come. It’s fantastic to see John Deere on board, as all of the truly major equipment companies are now represented. While using one brand over another isn’t particularly important to me, there’s something to be said for having a wide variety of options (including the most popular ones), just as one would have when purchasing equipment in real life. For the sake of clarity, I have been playing Farming Simulator 19 on PC, using a Logitech G29 steering wheel and pedals for the majority of the controls, with some use of my mouse and keyboard for certain functions. Despite a few minor hiccups in setting up my control scheme, I found the button mapping fairly easy. Some settings didn’t save properly at first, however GIANTS has since provided an update to the game that has rectified this issue. In terms of optimization I found the game runs quite well on my PC, which has an i7-6700 3.4 GHz CPU, 16GB RAM, and a 4GB GTX 1050Ti SC. On the game’s highest graphics preset, I was seeing frame rates anywhere between 45-60; turning the settings down from “very high” (there is no “ultra”) to the next lower setting (“high”), I was able to achieve a steady 60 frames per second without any dips – and the visual quality is still excellent. 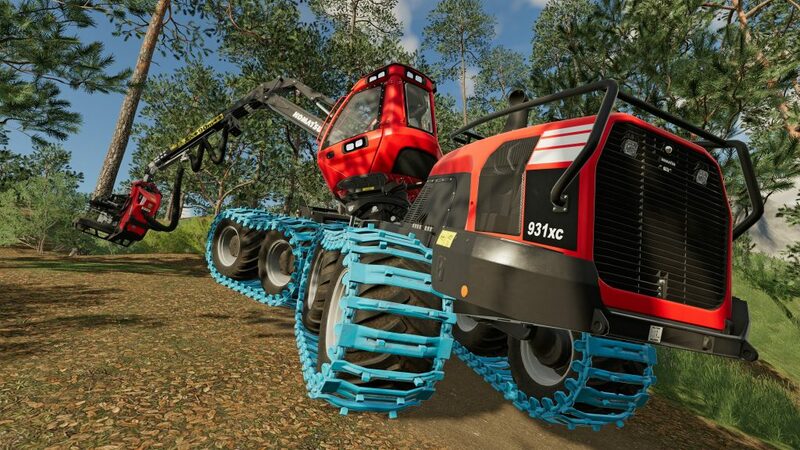 Farming Simulator 19 presents new options in terms of difficulty. Gone are the standard three options of Easy, Normal, and Hard that many will have grown accustomed to in previous games. We now have New Farmer, Farm-Manager, and Start from Scratch – I explained these in greater detail in my first look at Farming Simulator 19‘s gameplay. They still follow a trajectory of increasing the difficulty (by lowering prices paid for commodities, for example) but the biggest difference is what you own when you start out: two of the modes see you start without any land, buildings, or equipment. Your choice will also affect how much starting capital you have, and how much of that is a loan from the bank. Once you’ve decided on a difficulty/mode and a map (your choice of two brand new maps: “Ravenport” and “Felsbrunn”) to play on, the game prompts you to create your character. The character creation menu has been enhanced with more options than were seen in Farming Simulator 17, providing for a higher level of personalization (choose to rep a brand on your hat!). You see your character whenever you’re in a tractor and not using the in-cab view (which happens a lot) so you’d better like the look of them! With respect to the two new maps, there isn’t a bad choice to be had. Both are nicely designed with a variety of sell-points for crops, points of interest to explore, and cleverly laid-out fields and forested areas. Each feels distinct, and gives the impression of being in the locale that GIANTS intended: Ravenport exudes the vibe of a west-coast/southern USA fusion, while Felsbrunn feels like a mix between an agricultural haven and a functioning port city. I had expected Ravenport in particular to have more wide-open spaces, and its roads feel much tighter than I would have liked – with some of the larger equipment I found it difficult to get around the map, though with some adaptation I was able to work around most issues. Overall, however, I like the look and feel of the maps and think they’ll provide for some excellent replay value. In terms of pure eye candy, the game looks incredible. The overhaul of GIANTS’ graphics engine has undeniably enhanced the way that nearly everything looks. Of particular note are the vehicle models, which reflect light more realistically and really shine (pun intended). Some concessions have been made in certain areas in order to upgrade other things – for example, the distant landscape is slightly blurred, which I assume is to provide more processing power to the scenery that’s closer to the player, including the machinery in the immediate vicinity. There is also a sort of circle around the player where outside a certain distance, the plants and other textures aren’t fully rendered, leading to trees and other vegetation popping into the screen regularly (this was also the case in Farming Simulator 17, and is likely a limitation of the engine). This circle is more pronounced in Farming Simulator 19 due to the higher quality of the scenery that is fully rendered, and on lower graphics settings it does become quite noticeable due to the reduced draw distance and level of detail (LOD). The soil and crop textures look slightly better than what we saw in 17, however I still go back and forth on whether they’re a significant improvement. This depends somewhat on the type of field I’m looking at, as some textures look better than others. Overall, in spite of some concessions, the graphics are a marked improvement over the past versions of the game. I still find myself marveling at how gorgeous each tractor looks and the level of meticulous detail that GIANTS puts into each vehicle and equipment model, and from time to time the scenery also made me stop and stare. The clouds are particularly beautiful, and if you turn up the game speed you can watch them form and move across the sky in a sort of time-lapse. The heads-up display has also been changed substantially. What was previously a series of black boxes that provided all the necessary information has been transformed into a sleek, modern-looking set of gauges and images with transparent backgrounds. The result is a much sleeker, less obtrusive HUD that really serves to show off even more of the game’s beautiful visuals by taking up less of the screen. There were a few instances where the information was slightly difficult to see due to the colour of the background terrain at the time, however this occurrence was fairly rare and didn’t take away from my experience. This is but one of many “quality of life” improvements in the game. The in-game shop got a total revamp as well, and it now provides the ability to preview your equipment before you buy it. This allows players to check out the various wheel and colour options (or others, depending on the piece of equipment) before they spend their hard-earned money on something they might end up regretting later. The placeable workshop also provides this feature when customizing your equipment, so you’ll never have to worry about buying an upgrade or colour change that you won’t like. One additional very small, but very welcome change to the game’s shop is that addition of text telling you which brand the colour you’re choosing comes from, allowing for players to easily match their equipment to a specific colour scheme if desired. A minor hiccup saw me initially struggle to find some of the equipment due to the reorganization of the shop into some different categories than I was used to, however after spending a short time getting oriented and accustomed to the new layout, I was able to find everything I needed rather quickly. These fairly significant changes are accompanied by what I have come to call the “immersion-enhancing” additions. The birds that land in the fields and fly away when you draw near in your tractor, the subtle noises of birds chirping and coyotes yipping while you walk from your tractor to combine, and the way that dust kicks up when you drive down a dirt path or harvest your crops are all small but effective ways of making you feel like you’re really there. Other changes go even farther to make the game true-to-life: the engine speed of a tractor audibly changes when you turn on an implement (e.g., a seeder), just as a farmer would do in real life to ensure that the tool has sufficient power to operate before they start moving. Power-takeoffs (PTO – used for many implements to provide power from the tractor) are visibly attached to the tractor and spin when turned on, and hydraulic hoses now appear when you attach a tool as well. The knives (cutter bar) on combine headers are animated now. The roller/packer on the back of disc harrows continues to rotate after raising it off the ground. There are many other subtle animations such as these that contribute to the game feeling like you’re really farming. Another welcome addition is the ability to sleep through the night – assuming you’ve purchased yourself a farmhouse. Upon entering the house, with the press of a button you can choose to sleep for as little as 2 or as many as 11 hours (in one hour increments), speeding the game’s time clock up to 5000X and zipping through the dark hours and back to the light. In previous games, working at night was quite difficult due to poor lighting, so it’s great to have the option to skip it (though the improved lighting of Farming Simulator 19 makes it less necessary). This also contributes to additional realism, since skipping through time quickly at night means that you could slow the crop growth down (an in-game setting that can be changed) without feeling like you’re significantly extending the amount of real-life time it takes to actually see those crops become ready for harvest. 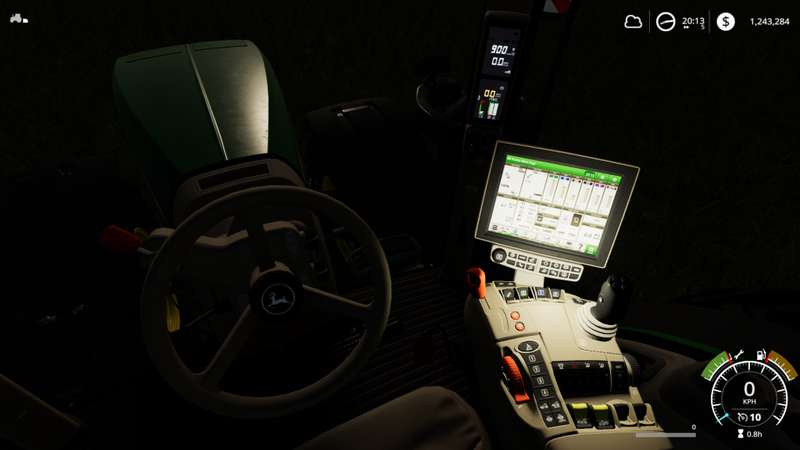 The dashboard in each tractor lights up when the lights are turned on, and the info screen (in the tractors that have one) casts a soft glow of light onto the panel below it. Some of these screens even show the engine speed, ground speed, time of day, cruise control setting, and more information in real-time. When you’re not in the first-person in-cab view, you can see your character bouncing up and down in the seat as you go over bumps due to the added seat suspension animation, and you can also see the driver pressing the gas and brake pedals and turning the steering wheel to correspond to your inputs. I even found myself admiring the look of the exhaust cloud coming from many of the tractors. Again, these are small – but noticeable – improvements that take the game a step above its predecessor in terms of realism. One change that some might have been looking for in Farming Simulator 19 is the addition of manual transmissions, known to many in the Farming Simulator community simply as “gearboxes”. GIANTS had previously indicated that they were working on incorporating the sounds of shifting gears into the game, however I didn’t notice any of these sounds so this feature must have been scrapped before release, likely due to it either creating problems in other parts of the game, or simply not being up to GIANTS’ internal standards. Further changes to the game include the removal of daily maintenance costs for vehicles; these have been replaced by the addition of vehicle “wear and tear”. Players will now have to take their machinery to the shop – or a placeable workshop should they buy one – to repair it when it starts to show its age. I haven’t had any equipment age enough to see if for myself, but GIANTS has said that the vehicles will show signs of age such as scratches, and their engines will too, using up fuel more quickly as they get older. On a similar note, there is now a slight penalty for resetting one’s vehicles to the shop (an option available in case you drive your tractor into a lake, for example): the vehicle that has been reset will have a nearly-empty fuel tank. This means that you likely won’t want to reset a tractor just to pick up an implement from the shop anymore. I did notice several minor glitches during my time with the game so far. The mirrors on vehicles (which are fully functioning the majority of the time) occasionally flicker between the mirrored image and a blank one if you turn the camera just so while in the in-cab view. There were also a couple of times where I was spraying a field and the sprayer boom passed directly over some birds without them reacting – however, this is understandable given the width of the sprayer boom (and I assume that the “contact” point for the birds is the main vehicle itself). Another small issue had me seeing grass coming through the bottom of some of the lower-riding vehicles (such as the John Deere Gator) when in the in-cab first person view. There were also some areas, particularly on the Ravenport map, where the amount of tree cover made it incredibly difficult to see where I was going. However, none of these minor issues are anything I would consider immersion-breaking, and I imagine some may be fixed by a patch at or shortly after release (plus I can fix the tree issue with a chainsaw!). The gameplay of Farming Simulator will likely never diverge significantly from what it has established over the last 10 years: at its core, the gameplay is about driving a wide variety of agricultural machinery, and having a number of options with respect to what you’re actually doing while you drive that machinery. Tilling the land, seeding your crops, fertilizing them, then harvesting and selling them has been at the core of the series since its inception – and why mess with success? What each iteration in the series has done is expand on the previous one, adding more activities to make it feel even more like you’re really working on (and managing) a fully functional farm. 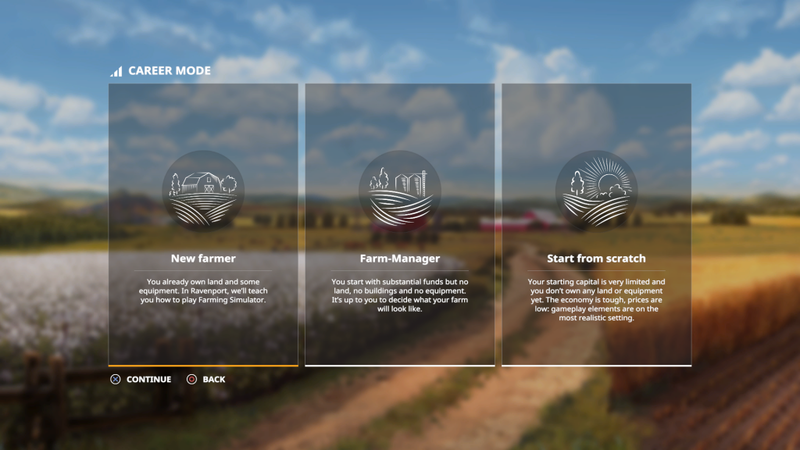 Farming Simulator 19 does this yet again by adding in several new game mechanics that change how players need to think about approaching their farming activities. 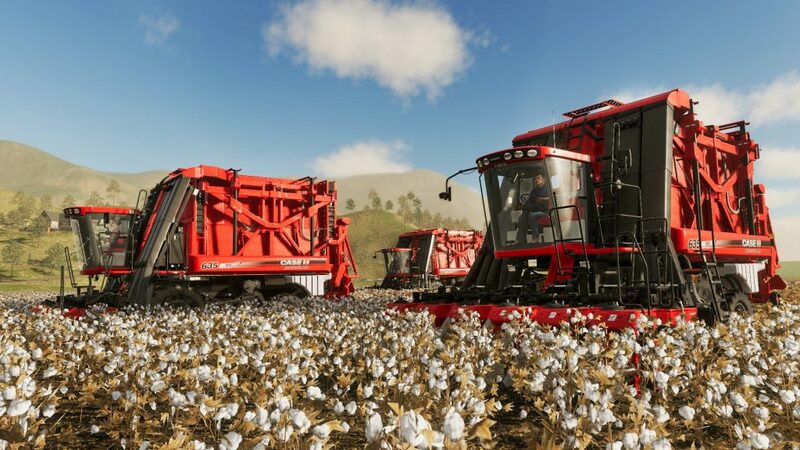 There are two new crops in Farming Simulator 19: cotton and oats. While oats are quite similar to some of the other crops in the game (e.g., wheat, barley) and are grown, harvested, and transported using the same equipment, cotton presents an entirely new specialty crop in the game. Producing cotton requires a specialized harvester, as well as a specific type of trailer to transport the cotton modules (which look like large white bales) once they’re unloaded from the harvester. This does provide a unique gameplay experience, as it adds a totally new sector for players to invest in, should they choose to do so. The equipment isn’t cheap, so it takes a commitment to get into cotton, and it also requires space to store the cotton modules if you don’t plan on selling them right away. You won’t be able to lift them with a loader, and they can only be transported one or two at a time with the special trailers, so it will take planning to determine the best time and method of selling your harvests. 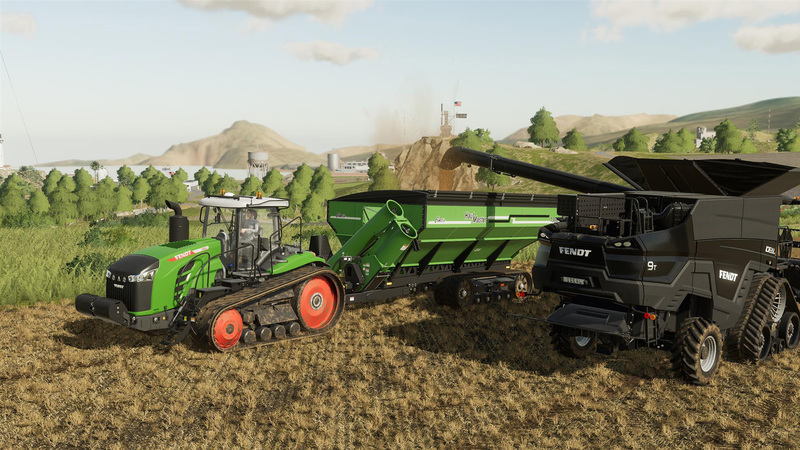 While Farming Simulator 17 introduced the requirement to fertilize your fields three times (as well as plowing them every third harvest) to reach maximum yields, Farming Simulator 19 tweaks this formula even further. Players now need to fertilize their fields only twice, and plow them every third harvest (though the plowing requirement can be turned off). However, you’ll now also need to worry about the presence of weeds, as they will appear at some point after seeding your crops and need to be removed with either a mechanical weeder or a sprayer loaded with herbicide. If you don’t take care of those pesky weeds before the crop is fully grown, you won’t be able to get rid of them anymore and your crop’s yield will be reduced. Also new is the requirement to spread lime on the fields periodically. So whereas in Farming Simulator 17 players only needed to concern themselves with fertilizing multiple times and plowing occasionally, in Farming Simulator 19 there are two additional tasks to add to the list. Those two activities are common – dare I say integral – to most modern farming operations, and so their addition takes the Farming Simulator series yet another step in the direction of realism. That doesn’t mean that the game is necessarily more difficult, but having more tasks requiring more equipment to reach maximum yields also means that it isn’t necessarily a given that you’ll be churning out high-yielding crops right out of the gate. On the harder difficulties, it may be too expensive to buy all of the necessary equipment at the beginning. This is a welcome change to me, since in previous games it felt relatively easy to follow the fertilizing and plowing requirements – now it takes more work, which in turn provides incentive to continue working towards being able to purchase that next piece of equipment on your list, whatever it might be. 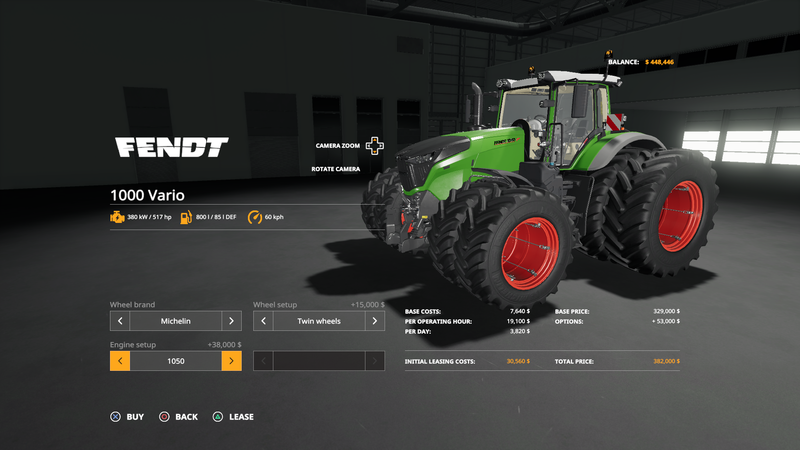 These new gameplay elements also mean that there is a wider variety of equipment and more incentive to diversify the types of equipment that one uses on their farm. Needing to incorporate these additional management actions to my crop-growing “routine” led me to feel as though I needed to employ several different pieces of equipment to get a fully-yielding field, and I enjoyed being forced outside of my usual comfort zone. To go along with the addition of herbicide and lime to the game, another mechanic was added: the ability to unload the contents of a sprayer, solid fertilizer spreader, or seeder. When this is done, the material appears on the ground beside the tool being unloaded in the same form that it’s bought from the shop – in big bags or containers on pallets, which can then be moved around and saved for later. 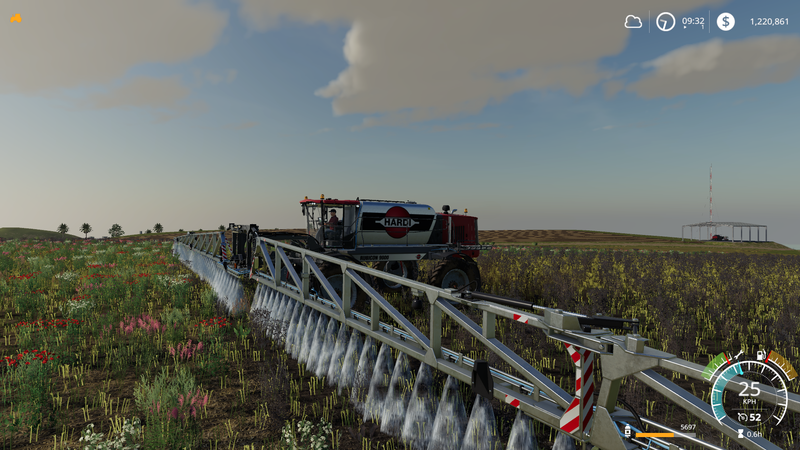 This adds another element of management to the game, and allows the same equipment to be used for two different tasks – in Farming Simulator 17 the fertilizer spreaders and sprayers were both only capable of fertilizing fields, which meant there was hardly any need to buy both. GIANTS has also added another way to tell the current state of your fields and what they might need. In previous games, the only way to know if your field needed plowing or fertilizing was to check the map in the menus and change the filters to show what you were looking for. 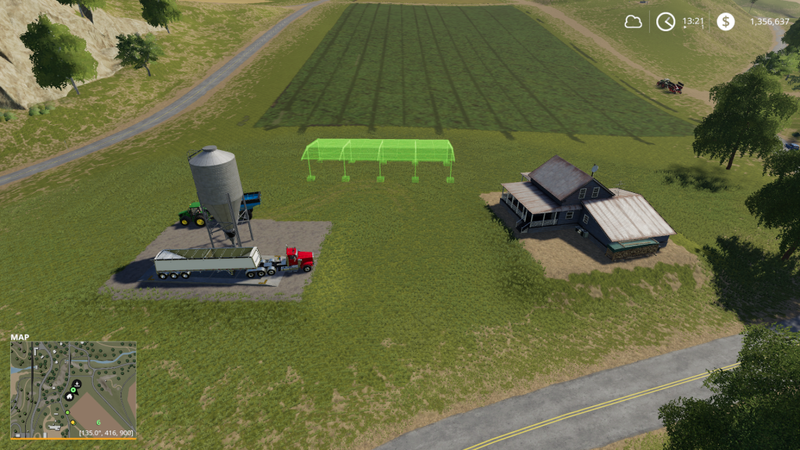 In Farming Simulator 19, if you walk up to one of your fields a handy “Field Info” box pops up in the bottom right corner of the screen, telling you who owns the field, what’s growing on it, the stage of growth it’s in, how fertilized and how contaminated with weeds it is, and if it needs plowing or lime. This is a great way to see all of the pertinent information on a field at one time, helping you make better management decisions. The only thing I wish is that GIANTS had added the ability to bring that box up by clicking on a field in the map – this would allow for easier decision-making when buying lands, as well as provide another mechanism for more effective management. That being said, the map will still show you want you want to know by changing its filters, just as it’s done in the past. Speaking of buying land, this is yet another change to the game that mixes things up fairly significantly. Instead of buying individual fields, you now buy entire tracts of land, including any trees and open spaces on them. This means that you can’t mow grass or cut trees anywhere you please anymore – you need to own the land if you want to modify it in any way. This means thinking more strategically about the areas you want to buy, particularly if you want to do any forestry or build structures. “Build structures?” you say? Yes, GIANTS has also greatly enhanced the way that placeable buildings work in Farming Simulator 19. As mentioned earlier, there are two difficulty levels that see you starting out with no land or buildings to your name. In order to grow your own crops, you need to buy your own land. If you want to store crops in a silo, you’ll need to build one. The maps no longer feature set points to house each type of animal, but rather there are two different sizes of purchasable enclosures for each of them. This necessitates some forethought in terms of managing your finances as well as leaving available space on your property to build these structures. 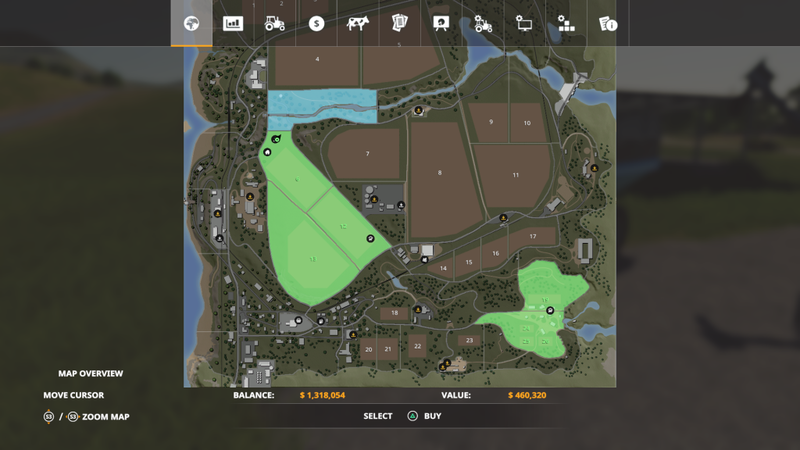 What is also allows for is total customization, since you can locate all of your animals close to each other if you’d like, or close to some other key point (such as your silage bunkers, which are also placeable). One thing this also does is make the game slightly more difficult in terms of being able to start caring for animals, since it adds an extra step – and cost. The placeable system works fairly well, as GIANTS has added an “auto-leveling” ability to the terrain so that when placing a structure, the ground will automatically flatten in that area. This did come with some issues, however, as I struggled at times to find places to place my buildings that didn’t result in at least a couple of the sides being surrounded by a steep – though short – hill. This meant that there was more than one occasion where I had difficulties in accessing my buildings – such as a horse paddock – with the equipment needed to care for those animals, since it almost felt like a raised platform of sorts. Understandably, the game can’t allow a building to be built on an angle, and the auto-leveling on a slight slope results in one end of the structure to be raised above the ground. However, it would be great if there were a better way than the current system to visualize how the building will look once it has been placed. Alternatively, players will just have to be extremely careful in determining where to build their farm. Players will indeed need to be careful when placing buildings, as one fairly significant gripe that I had with the placeable system was that of cost. The buildings themselves are priced reasonably, and don’t present a large barrier to entry (e.g., for the various types of animals). However, if your location of choice requires some additional terrain modification, this is reflected in heightened “construction costs”. For instance, at one point I constructed a large chicken coop, which is listed at $40,000 in the game’s shop. After selecting a portion of an existing field that I owned (which looked quite flat, mind you), the fairly minor terrain modifications resulted in a total construction cost of over $133,000. At first I thought that there was no indication of the increased cost prior to placing the building, however I have since discovered that the help menu (which I had turned off) does in fact show the projected cost of terrain modifications. Regardless, these incredibly inflated costs could leave players frustrated with needing to spend much more of their money than intended on buildings, particularly if they don’t know just how much until they buy (if they’re like me and turned off the help menu). It also came to my attention that the buildings can be adjusted higher or lower before placing them in order to avoid the creation of hills and the associated costs, however this wasn’t well explaiend. There’s definitely an argument to be made in favour of the construction costs: ground doesn’t just magically move itself, after all, and if it’s realism we’re aiming for, there would certainly be a cost associated with this. However, in my opinion these costs should be significantly lower for the purposes of the game, and I feel that without clearer instructions around placing buildings and the total costs of doing so, this new feature may not be well-received. There are two sizes of each animal enclosure available for purchase/placing, depending on how many you’d like to house. Animal care works the same way it did in Farming Simulator 17, with each enclosure requiring some, if not all, of a combination of feed, water, and straw. 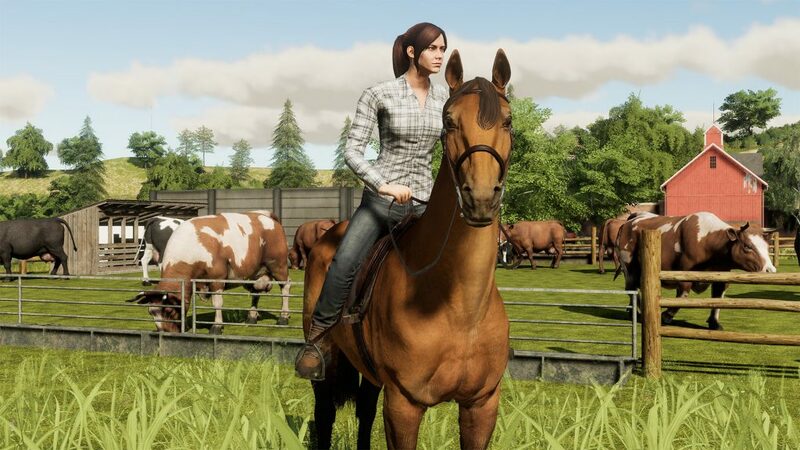 Most notable in the animal portion of the game is the addition of horses, which must be “trained” by riding them each in-game day in order to raise their grade (and thus their value). I was blown away by the animation of the horses, and I love that they offer something very different from what players are used to with respect to caring for (and profiting from) an animal in the game. Logging hasn’t changed significantly, with the exception of new equipment from Komatsu and MAN being added. The new Komatsu tree feller and forwarder work identically to the PONSSE machines from Farming Simulator 17 (which have returned to the lineup), but the MAN truck with an attached crane offers a new way to transport logs. The physics of logging seems largely the same as well, though I found that the logs didn’t seem to bounce around as much as before (or maybe my loading skills have just improved!). There is also an optional “boom assist” that simplifies the controls of some of the more complex crane equipment somewhat, reducing the number of button combinations required to effectively operate them – this should be a welcome addition for novice players, as working the cranes could be daunting for those unfamiliar with them. Ultimately, the forestry side of the game still offers a nice change of pace from the typical farming activities, and the need to buy land in order to harvest the trees on it adds a bit of a fresh twist. If you’re looking for a way to make some extra cash in the game, the contracts system has also had an overhaul. 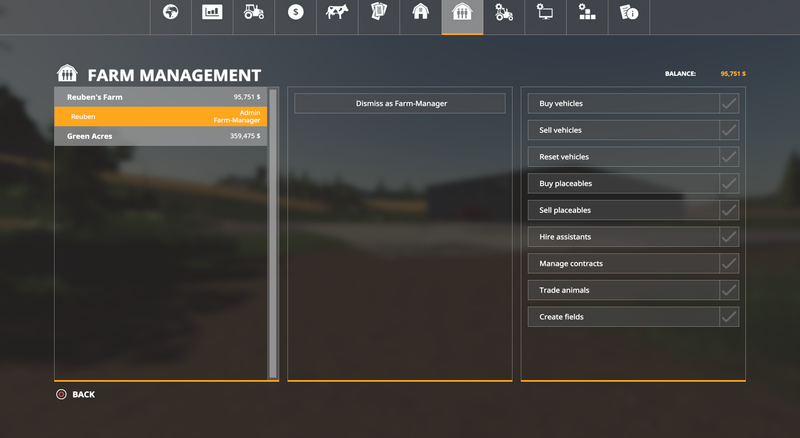 You can now choose whether to use your own equipment while doing jobs such as seeding, fertilizing, or harvesting crops for other (non player-controlled) farmers around the map, or use equipment borrowed from the farmer for a reduced wage (which was the only option in Farming Simulator 17). The even bigger change here is the elimination of any time limit for completing the contracts, and it is a welcome one. Now if you engage in a long mission (some of the larger ones in Farming Simulator 17‘s base game were upwards of 2 or 3 hours) you’ll no longer be stuck: you can leave the field to tend to your own farm, or even save and quit your game and return later, with no penalty. This is much more realistic as well as more forgiving, as players can now more readily accept large jobs without giving up the opportunity to progress their own farms at the same time. You can even hire a worker to keep your contract work progressing if you need to go tend to other business on your farm, however if you use one to complete the entire task, you won’t end up making any money. As another added bonus to the new contracts system, the “transport” type jobs – popular in Farming Simulator 15 but removed for Farming Simulator 17 – have returned, which provides some additional variety to the types of contracts available. 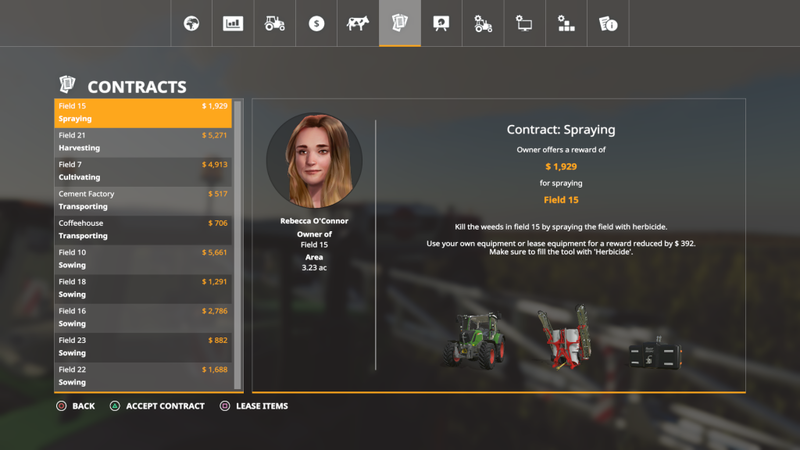 Also new in Farming Simulator 19 is the ability to undertake contracts in the game’s multiplayer mode. This adds a new way for players to make money while others in their crew go about other farming tasks, which allows for greater diversity in how a group can approach their farm. However, this relatively significant change pales in comparison to the other enhancements offered to the multiplayer. In past Farming Simulator games, one player controlled the “bank account” on a multiplayer server, doling out money to allow their friends to purchase new equipment or land (if they were feeling nice). Most of the time, this meant that players essentially worked for “free” when in a multiplayer server, simply working towards building up one set of equipment, land, animals, etc. However, these times are behind us now. 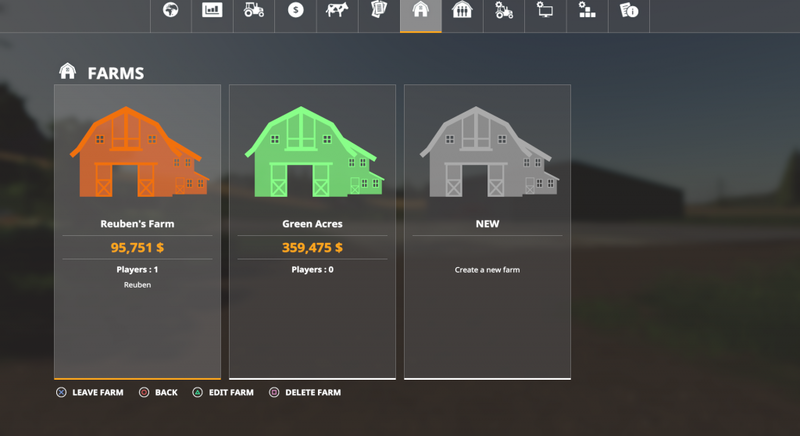 Farming Simulator 19 introduces the ability for players to have entirely separate farms, with their own land, equipment, buildings, animals, and bank accounts. This allows for “competitive” farming if desired, as players can each start their own farm and see who can make the most cash in the shortest time. This shift opens up a world of possibilities for those who like to play the game together. Want to start a farm together and build it up like you did in previous games? Go ahead. You’d rather specialize in cows, and your friend would like to build a farm across the map where they raise horses? Sure thing. Can another friend join and exclusively do custom baling – that is, simply buy haying and baling equipment and sell the bales to the other two players? You bet! You can add and remove players from separate farms at will, and a player doesn’t have to “leave” their own farm and equipment behind to work on yours. You can grant them “contractor status”, which means that they can 1use their own purchased equipment to conduct work on your fields – or use your equipment to help you complete a task, such as a particularly large harvest. This is a massive change to how Farming Simulator‘s multiplayer mode functions. I was blown away by how seamlessly I was able to grant – and take away – contractor status and how the permissions of those I was playing with changed instantly. I took away contractor status while a friend was in the midst of fertilizing one of my fields, and it instantly told him that he no longer had access to that land. I’m incredibly excited by the possibilities of being able to specialize in certain areas and co-exist with other farms that may specialize in something entirely different, and the options that gives all of the players involved. There are still a few issues with the multiplayer mode at this point – the synchronization of data between players when a new farmer joins the server still takes a short time, though I believe that GIANTS has reduced the length of the synchronization significantly (this may also be accredited to my server being 100/100 Mbits per second, so the synchronization time may differ on slower connections). I also experienced freezing the first couple of times that I attempted to create a server, however after being able to create farms and start playing with no issues, I didn’t encounter any freezing when quitting the game and re-creating/joining it. I’d be remiss not to mention that one major gripe that players have had with the game’s multiplayer has been addressed in Farming Simulator 19. 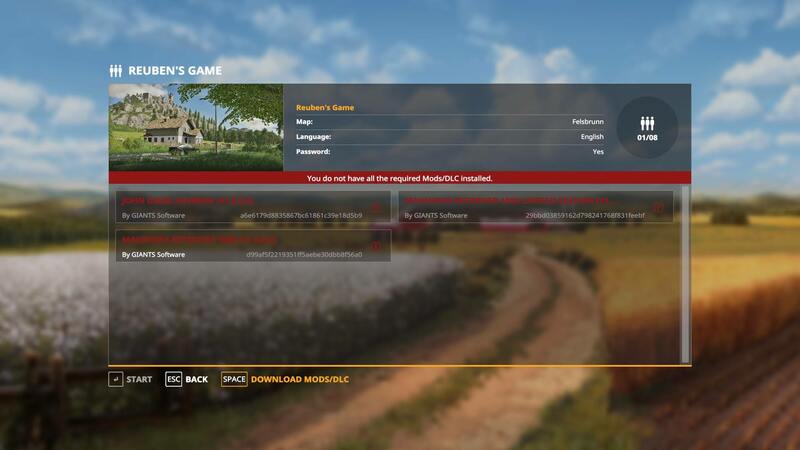 Players still need to have the same mods as the server host downloaded and installed on their machine in order to join the server, however they will now be shown a list of the required mods before joining – and the game even presents an option to go to GIANTS’ ModHub to download what’s missing. This should make it much easier to identify what you’re missing and allow you to get past administrative details and into playing the game much more quickly. There are so many new things in Farming Simulator 19, from big new features to small enhancements to subtle world-building. I was a big fan of both Farming Simulator 15 and 17 and felt they were fairly complete packages, and so I am astonished by the advancement that Farming Simulator 19 presents for the series. There are certainly some bugs that need to be rectified, and additional tweaks to the new systems could help improve the game even further. However, there is so much to love about this game and the dedication by GIANTS to continually improve it, despite the lack of any serious competition. During my time with Farming Simulator 19, one word has consistently risen to the forefront of my thoughts: immersion. Each of the enhancements that GIANTS has implemented bring the game closer to mimicking real life. If you’re fixin’ to feel like a farmer, this is the place to start. Don’t let that scare you – it’s still a simulation game. You won’t be needing crop insurance or a veterinarian on speed dial, but what GIANTS has built with this game raises the bar for agricultural simulation games – or rather, simulation games in general. Farming Simulator 19 stands out as the best in the series, in spite of a slight misstep with the farm building and some other glitches, which will hopefully be rectified post-release. There have been many changes to the game, and ultimately I feel that not one of them is a step backward. With Farming Simulator 19, GIANTS has taken the series to the next level. I’ll be farming these virtual fields for a long time to come! If you’re fixin’ to feel like a farmer, Farming Simulator 19 is the place to start. 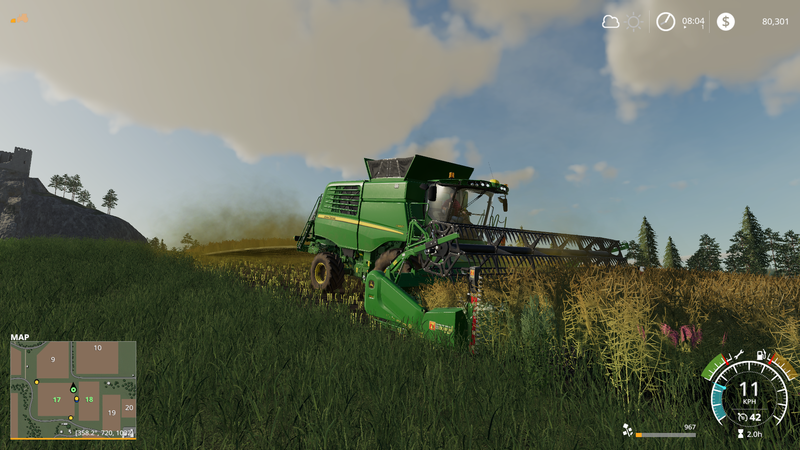 What GIANTS Software has built with this game raises the bar not only for agricultural sims, but for simulation games in general. The review copy of this game was a digital code provided by the developer. Next articleJackbox Games coming to a bar/restaurant near you!